Live video took the world by storm in 2016, and we’ve got the live streaming statistics to prove it. 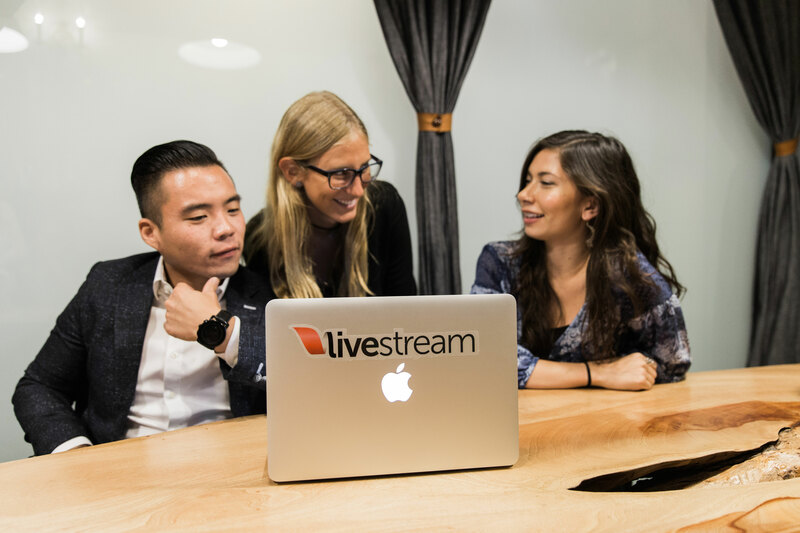 Our streaming experts have compiled a list of need-to-know live video statistics that will teach you exactly what you need to know about livestreaming. Find out how audiences are engaging with live video, their favorite platforms, and which industries are leading the live video revolution. 1. 81% of internet and mobile audiences watched more live video in 2016 than in 2015. 2. Breaking news makes up 56% of most-watched live content, with conferences and speakers tied with concerts and festivals in second place at 43%. 3. Live video is more appealing to brand audiences: 80% would rather watch live video from a brand than read a blog, and 82% prefer live video from a brand to social posts. 4. 67% of live video viewers are more likely to buy a ticket to a concert or event after watching a live video of that event or a similar one. 5. Behind-the-scenes access is a huge draw for 87% of audiences, who would prefer to watch online vs. on traditional television if it meant more behind-the-scenes content. 6. 45% of live video audiences would pay for live, exclusive, on-demand video from a favorite team, speaker, or performer. 7. Video quality is the most important factor for 67% of viewers when watching a livestream broadcast. 8. 78% of online audiences are already watching video on Facebook Live. 90% think video quality is the most important aspect of Facebook Live videos. 9. 86% of colleges and universities have a presence on YouTube, according to the University of Dartmouth. 10. YouTube reports mobile video consumption rises 100% every year. 11. Average time spent for video on mobile is 2.8 minutes for VOD and 3.5 for livestreams. 12. Average time spent for video on tablets is 7.1 minutes for livestreaming versus 4.1 minutes for VOD. 13. Average time spent for video on desktop is 34.5 minutes for livestreaming versus 2.6 minutes for VOD. 14. According to Tubular Insights, viewers spend 8X longer with live video than on-demand: 5.1 minutes for on-demand vs. 42.8 minutes for live video content. As brands compete for eyeballs in the newsfeed, live is a key differentiator. 15. By 2016 video ad spending will reach $5.4 Billion according to Break Media. 16. 92% of mobile video consumers share videos with others, according to Invodo. 17. 40% of young mobile users report watching native forms of video on their smartphone more frequently than they were a year ago. 18. Live video is outpacing the growth of other types of online video, with a 113% increase in ad growth yearly. 19. Compelling content is the primary motivator for live online viewing. 20. 45% of internet users view at least one online video over the course of a month, according to comScore. 21. 100M internet users watch online video every day. 22. The global VOD market in 2016 is about $16.3 billion. 23. VOD accounts for 16% of the Digital Media Market. 24. 4X as many consumers would rather watch a video about a product than read about it. 25. Users spent 10 billion hours per month watching Netflix for a total of 42.5 billion streaming hours in 2015. 26. According to Deloitte, 70% of Netflix users binge-watch shows. Among millennials, 35% did it on a weekly basis. 27. Hulu has streamed 700 million hours even though they have 9 million subscribers compared to Netflix’s 81 million. 28. Amazon Prime is gaining more traction with 54 million members at the end of 2015, a 35% jump from the previous year. 29. By 2019, online video will be responsible for four-fifths of global Internet traffic. 30. In the US, online video will be responsible for 85% of domestic internet traffic. 31. 75% of executives watch work-related videos on business websites at least once a week. 32. According to Forbes, 59% of executives would rather watch a video than read text. 33. 79% of websites that feature video use third party hosting. 34. 96% of B2B organizations are using video as part of their online marketing. 35. 73% of B2B organizations report positive ROI from video marketing. 36. According to a report published by Forrester, including video in an email leads to a whopping 200-300% increase in click-through rate. 37. An introductory email that includes a video improves an increased click-through rate by 96%. 38. Digital marketing spend will grow from $57.29 billion in 2014 to $103.37 billion in 2019. 39. 23% of people who have been presented with a poor quality video experience would hesitate to purchase from that brand. 40. User-generated short clips accounted for 51% of live video content streamed to smartphones as of 2015. 41. Video on social media generates 1200% more shares than text and images combined. 42. Companies using video enjoy 41% more web traffic from search than non-users. 43. Retail sites with video increase conversion by 30%. 44. 40% of consumers state that video increases the chance they’ll purchase a product on their mobile device. 45. Mobile and tablet shoppers are 300% more likely to view a video than laptop/desktop users. 46. 62% of consumers are more likely to have a negative perception of a brand that publishes poor-quality video. 47. 52% of marketing professionals worldwide name video as the type of content with the best ROI. 48. Video on a landing page can increase conversion by 80% or more. 49. Combining video with full page ads boosts engagement by 22%. 50. 70% of marketers claim video produces more conversions than any other content. 51. Businesses using video grow company revenue 49% faster year-over-year than organizations without video. 52. Native video uploads to Facebook have 10X higher reach compared to shared YouTube links. 53. 74% of millennials find video helpful when comparison shopping. 54. Millennials are more likely to consume live content on a smartphone (56%) or tablet (44%). 55. YouTube has over a billion users, and 80% of its views are from outside of the US. 56. Video drives a 157% increase in organic traffic from search engines. 57. The average conversion rate for websites using video is 4.9%, compared to 2.9% for those who don’t. 58. “How to” searches on YouTube are up 70% year-over-year. 59. 1.8M words: that’s the value of one minute of video, according to Dr. James McQuivey of Forrester Research. 60. 88% of visitors stay longer on a site with prominent video displayed. 61. Online video is about 50% of all mobile traffic. 62. Email subscriber dropout is reduced by 75% with the incorporation of video. Looking to get started with live video? Check out our Ultimate Guide to Livestreaming for more information, including stats, case studies, and how-to’s.